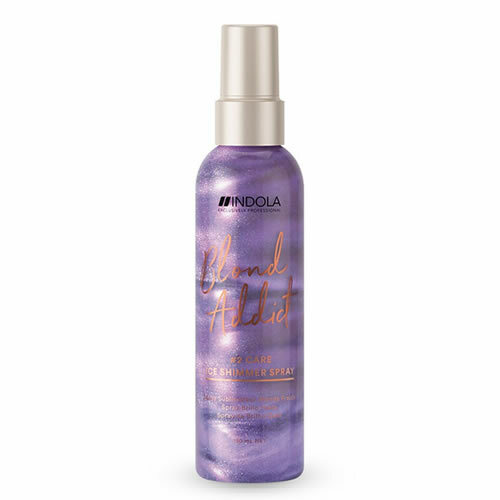 Indola Blond Addict Ice Shimmer Spray is designed to help you achieve perfect cool blondes. Its formula, containing hydrolyzed keratin, neutralizes yellow and brassy tones while adding smoothness to hair. Ice Shimmer Spray is part of step #2 (Care) in Indola's Blond Addict range. To achieve an extra icy cool look, use Indola's Instacool Shampoo or otherwise with Blond Addict Shampoo as step #1 (Wash) in your blonde hair care regime. Blonde shampoo that instantly neutralizes and optimally eliminates brassy tones for the brightest of blondes. Available in a 250-ml tube. Specialised shampoo designed to wash and build bonds in all types of blonde or highlighted hair. Available in 250 ml or 1000 ml.